Small group lessons can begin at any time. 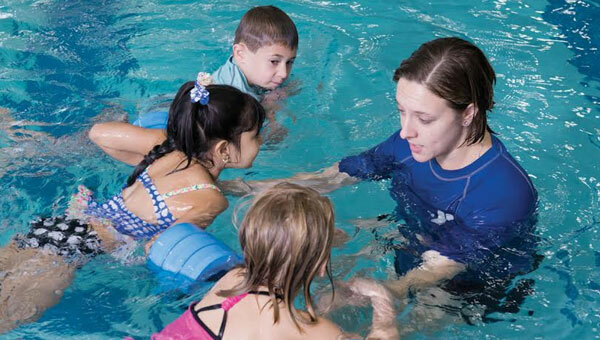 To arrange lessons, contact your Y’s Aquatics Manager. Contact an Aquatics Manager at your local Y. Sign up for your trial pass today. If you become a member, you’ll get discounts on Swim Lessons. Together, the instructor, participants and/or parent determine the goals for the session and the curriculum is customized in order to meet these goals. Please bring photo ID when you visit the Y. Know what you want to work on and achieve and share that with your instructor. Inform the instructor of physical impairments, fear of or bad experiences with the water to ensure a more positive lesson. Come to class dressed and ready for the pool. Clothes, street shoes, diaper bags and other personal items can be stored in the locker rooms; bring your own lock and leave your valuables at home. Family appropriate, clean swimsuit and swim attire is required. Sandals or flip-flops are permitted in the pool area; No street shoes permitted. Price is split between all participants. Lessons are 30 minutes each. Purchase your swim lesson package at your nearest Y location.